MAHATMA GANDHI'S name requires no introduction because of his invaluable contribution to the national liberation movement of India. His reputation as a true nationalist as well as an internationalist shines like the sun itself. But in the academic sense of the term, he is not considered a great scholar or an educationist. We have not been enlightened by his views on education or on the problems relating to it, through any particular book written by him. There is no special research article available which could have given us a glimpse of his ideas or suggestions on the education system, except his occasional articles on the future of education in India written in a very simple manner. The same thing applies to the views he expressed on the subject now and then. Despite this fact, the few articles that Gandhi has written in the simplest manner, and the views he expressed on education as a common man are of utmost importance. They provide us with a guideline to proceed towards value education. Not only this, if we apply them even in the modern perspective, they can definitely give a new dimension to our education system. Gandhi once said: "Education means all-round drawing out of the best in child and man—body, mind, and spirit." As such, education becomes the basis of personality development in all dimensions—moral, mental, and emotional. Therefore we can say that in the long run education forms the foundations on which the castles of peace and prosperity can be built. Since ancient times, it is said "Sa Vidya Ya Vimuktaye," which means that with education we finally attain salvation. This small Sanskrit phrase essentially contains the thought and essence of Value Education that is relevant in all perspectives. This very concept, when applied to the simple but refined approach of Mahatma Gandhi, can provide us with a new dimension of educational development. 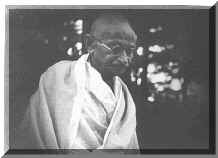 As such, while analysing the views of Mahatma Gandhi, we can examine his views under two main heads: morality and ethics. Moral and ethical knowledge is the first point on which Mahatma Gandhi's concept of value education is based. Any education system that lacks these two cannot be termed as good. The reason behind such a thought is that, without morality and without ethics, no student, in a real sense, can be considered to be healthy in mental and physical terms because, for it, self-control and good character are essential. A person who is not a moralist and who does not differentiate between right and wrong cannot rise to the essential level of a true student. The the attainment of spiritual growth that has been described by Mahatma Gandhi as an essential part of education can be gained only through morality and ethics. Seeing it through another viewpoint also proves the same thing, because when we consider education as a means of attaining salvation and also as a support on the pathway to liberation, we cannot differentiate it from spiritualism. Mahatma Gandhi laid down some rules for students so as to ensure that morality and righteousness always be considered as an essential part of education so that every student shall gain in terms of knowledge and spirituality. He said that, on the one hand, where students should gain education under the strict regimen of high morals, self-control, and right thinking; on the other, they should also be expected to provide service to the society in general. This includes their respect towards parents, teachers and elders, love for children, following of social traditions and constant awareness towards their duties and responsibilities. In order to strengthen morality and ethics in students, Mahatma Gandhi advocated the introduction of religious education. This kind of education brings the values of forbearance, tolerance, and reverence in one's character. And, in turn, these values are an indivisible part of ethics. Explaining the importance and need of religious education, Gandhi writes in Young India of 6 December 1923: "A curriculum of religious instructions should include a study of the tenets of faiths other than one's own. For this purpose the students should be trained to cultivate the habit of understanding and appreciating the doctrine of various great religions of the world in a spirit of reverence and broad­minded tolerance." Mahatma Gandhi calls upon all teachers to impart proper education of morality and ethics to students both at the school and at the college levels. In this regard while suggesting some guidelines for teachers, he says that it is the duty of teachers to develop high morals and strong character in their students. If teachers fail to do so, it means that they depart from their social and national responsibilities and, as such, they are also insincere towards their noble profession. He said that a teacher should lay an example to be followed before society and students. This can only be done when he himself leads his life with high standards of morality and strong character. An ideal teacher should be free from any addiction. He needs to be polite and should set an example of simple living and high thinking. He should also remember that wasting time is a sin; therefore, he should be aware of his duties towards students and society. Moreover, he should have a good reputation in society. Therefore it is the foremost duty of students, as well as of teachers, to make certain that moral and ethical knowledge continues to be an integral part of the educational process. By doing so, they can contribute to the development of value education. Another important aspect of Mahatma Gandhi's value education is basic or technical education. The word buniyadi (or basic), which Mahatma Gandhi used in the third and the fourth decades of the twentieth century, meant knowledge or education that could help rural people in the promotion of village handicrafts or to establish cottage industries. The ultimate purpose behind his attempt was to make young men and women self-reliant in the economic field. Even in the modern perspective, his idea of buniyadi or basic education is applicable and it does not clash with the concept of today's job-oriented or technical education. In fact, Mahatma Gandhi wanted the students to prepare themselves for technical knowledge right from the days of their primary level of education. In this regard, his logic is not only important but adaptable; it can prove to be a milestone in the direction of value education. It is not that Mahatma Gandhi did not talk of all-round or complete education on different occasions. He definitely spoke of imparting education based on curriculum; he, more or less wrote about graduate and postgraduate levels of education. Not only this, as I have just discussed, he laid emphasis on moral and ethical knowledge, which is helpful for character building and for the physical and mental development of a student from the very beginning of his education. He clearly believed that without a healthy body; the mind could not be developed fully. It is but obvious that when a child starts his formal education, he enters at the primary level and, step by step, at an age of twenty or twenty-two, he graduates from university. After so many years, if he does not find a goal or lacks a direction to begin his career, then what could be the use of such an education? What is the use of the degree that he has in his hand? After obtaining a degree, students should have a clear direction for their future; they should have no doubts towards their future goal and should be full of self confidence. Side by side, they should be self-dependent and capable of tackling unavoidable day-to-day problems. They must not be worried about a suitable job. But, in reality, these days we see that our younger generation is directionless. Our youths are diverted and a feeling of helplessness and dejection is prevailing on them. According to a survey, there are millions of men and women who, even after completing their studies at graduation, post graduation, and doctorate levels, fail to seek an employment of their choice. Is it not a failure of our social and educational system? Even after spending the golden years of one's life in attaining higher education, our youths are not self-dependent. As such, how would they be able to get rid of their day-to-day problems and how would they contribute to the society and the nation? Therefore it is a challenge not only before the youths of this country but also before the educationists, scholars, and those in the government to solve this problem. To tackle this problem, Mahatma Gandhi's views can be of great help. In this reference, he has said that there is a need of result-oriented education. He said that every child has some special qualities that can also be termed as inherited traits of personality; so at the primary level, a student's quality and worth should be identified by his teacher. A student should gain education according to a curriculum and moral guidance and as such also improve his physical strength. But the teacher should watch and identify his quality that could be of help in his later life. For that purpose, it is necessary that after completing studies up to a certain level, he must, in addition to the three kinds of education—general (according to syllabi), moral, and physical—be provided facilities to gain technical knowledge in accordance with the special trait that has already been identified in his personality by his teacher. Since by nature he has interest in that knowledge, he will easily gain it; he will become adept in that. When he completes his study up to graduate level and with this extra knowledge comes out of a college or university, he would have a direction. As such, even if he does not get a private or government job, he would manage to get through some sort of self-employment on the basis of his technical knowledge. At least, then, his education would be considered as result-oriented. This is Gandhi's view-point pertaining to value education which should be applied in a wider perspective. Its worth lies in the fact that education should necessarily be helpful in employment and its foundations should be laid on morality and ethics. We who are concerned with education need to think over Gandhi's views on education. We have to apply Mahatma Gandhi's ideas according to the present circumstances of our country and also as per the demands of time.